How softly Johann Strauss’ On the Beautiful Blue Danube begins. It gathers strength and purpose until it reaches your soul. There it swirls around and dances with you, sometimes playful, but always purposeful. Gradually, you feel at one with the music and find yourself wanting to move with it. At that point, it has you and lifts you to heights you have always desired. I often have felt that composers, capable of writing songs that are beautiful and majestic, provide us glimpses into their very souls. Like painters and saints, they have the capacity of reaching out to their God, and in so doing, provide us glimpses of Him, as well. Knowing that all analogies fall short let’s compare music with love. Music, in the mind of the composer, has a purpose, be it to bring you joy, or beauty or something else. Whatever its purpose, though, it is always something positive. A feeling of sorrow can also be positive, as long as it is not intended to leave you there. Music, when performed as the composer intended, lifts you up, plays with your feelings, and delivers you to a better place. How does love compare with music? True love, not the love portrayed on so many TV and movie screens today, true love seeks out goodness for someone else, never self. When a person feels a love for someone else, their own spirit is joyous. They may feel light and airy, or they may feel quietly happy. Either way, the goodness that they feel is deep inside them and can’t wait to express these feelings to their beloved. When you feel this love, you know, not only that it is true, but that it will be beneficial to both persons. It is never one sided. Christ has this love for us, you and me. 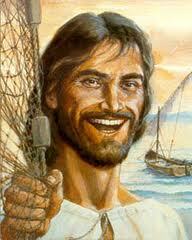 When I see a picture of Christ smiling, for some reason, it touches me so much more than one of Him suffering, or performing miracles, or anything else. The smile that He has seems to convey to me His fondness, His love and His concern for me. Strangely, it is at these times, I realize how I fall so very short of being able to return His love. Knowing His love is there for us, though not demanding anything in return, how very much I desire to love Him. His smile, His love picks me up and dances with me. Knowing His love is there for us, realizing it is continually there for us, we are invited to join Him. Once we recognize His love, once we see how it is freely given then our love that we return to Him takes on a deeper significance. We are loving someone who gave His life for us. We are loving someone who asks us to become Him. Our love for Him has grabbed us, awakened us. How can I say I love Jesus, if I do not love my fellow man? It is impossible. No excuses. No golly gees. That person is of a different color. That person is dirty or slovenly. That person is not charitable. That person is downright evil. All the people that we have difficulty with… we must love, have a true concern for their growth, their sickness, their lack of morals. Christ came into this world, for sinners, YOU and ME. Our expectations that others clean up their act, goes equally for ourselves, as well. With this love that Christ brings us, it swirls around us, it lifts us up, and it makes us better than we ever dreamed. We are then, finally, caught up in the music of love. « Where am I Now?